Every community is unique. The unique character of a community will be reflected in the community planning process. 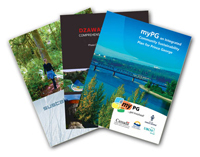 To help your community design a meaningful sustainability planning process, Smart Planning compiled a selection of planning documents from BC communities. They are available in an archived digital library here. We hope these examples will help your community approach each phase of the planning process with confidence. Smart Planning for Communities was not involved in these planning processes directly and does not take responsibility for their content structure. The samples are simply meant as a starting point for your community to learn from and to inform the planning process. We thank all of the communities and consultants for their input into this database of samples. To find more examples of sustainability plans and affiliated documents from across Canada visit the Canadian Sustainability Planning Inventory online searchable database.